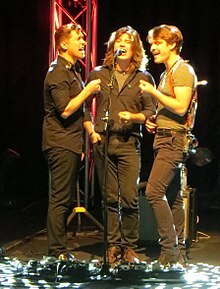 Hanson is an American pop rock band from Tulsa, Oklahoma. The band was formed in 1992 by brothers Isaac, Taylor and Zac Hanson. They are best known for their 1997 number one single "MMMBop". The song was nominated for two Grammys at the 1998 Grammy Awards. They started their own record label 3CG Records in October 2003. Hanson were at first called The Hanson Brothers. They performed for the first time in 1992 at the Mayfest Arts Festival in Tulsa. Hanson released their first album Boomerang in 1995. In 1997 Hanson released their third album Middle of Nowhere. It sold ten million copies. Five singles were released from it. "MMMBop" was the first single. The band was signed to Mercury Records in 1996.